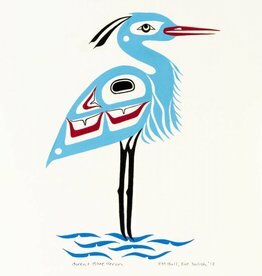 Pauline Michele Bull is an Interior Salish native, and is a band member of Seton Lake, BC, Lillooet nation. Her crest follows her father's clan which is, "People of the Crane". Her mother is from Lytton, BC, and her mother's clan is, "People of the River". Her father is from Seton Lake, BC, also known as, "Sh7us" which means, "Coming to head of the lake" in St'at'imc native language. Pauline was born on September 21, 1964, and has lived in Vancouver, BC, all of her life. Pauline was introduced to the art by her aunt who taught her to bead in the mid 80's. Pauline's painting career started in 2009 with encouragement by Eric Parnell, Haida Gwaii artist, and has been collaborating with Eric since then. Eric Parnell does the designing and outlining of projects and then Pauline assists with the painting. Pauline's first project was painting a 7.5 foot statue for the "Eagles In The City Project", which was sponsored by Easter Seals. 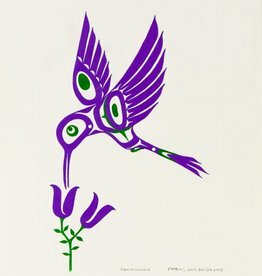 From there, Pauline assisted Eric Parnell with painting a canvas and a wood panel for the Vancouver Native Housing Society, drums for a local gallery, as well as bentwood boxes for the Urban Aboriginal Fair Trade Gallery. Pauline went on to painting on paper. Pauline's own style is a combination of realistic and traditional. Pauline has been designing and painting her own art work since 2010. Pauline considers the art to be very spiritual and healing. One of her goals as an emerging artist is to be a small part of reviving our native culture.